For many Shelby Charter Township residents, a stump in the yard is as familiar a sight as the color of their home. Between struggling to mow around it, worrying if the kids will trip and fall over it, and generally hating the way it looks, it’s no surprise that most local homeowners want these unwelcome guests gone. Often, the problem with this is simple: Stump removal is tough work. Without specialized equipment, digging up a stump and safely disposing of it can be quite the challenge, especially for only one or two people. Worse still, stumps do not go away on their own; their biodegrading process is long and slow, and they will be even less attractive to look at and safe to interact with than they were prior. If you can’t remove it and you can’t leave it, then you need professional help. By contacting Halo Tree Service, you can get qualified, professional tree and stump removal for your home. We have specialized stump grinding equipment that makes quick work of stumps, leaving you with only a more beautiful and safe yard for years to come. Our highly experienced and knowledgeable team will take their time to assess your trees and stumps and present a plan that will keep your landscaping looking great. By removing old, unsightly stumps from your home, our tree service will bring a fresh new look to your home’s curb appeal. By using specialized industry equipment, our tree service professionals can grind your stump in place, rather than digging a massive hole to remove the large system of stump and roots. 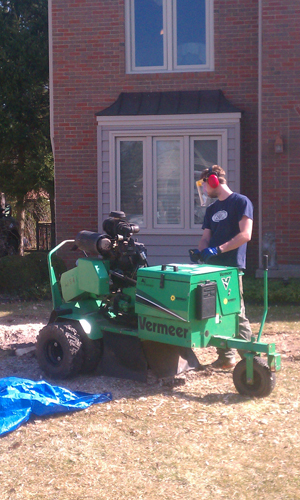 We grind out the stump where it sits, remove the pieces, and leave you with a fresh new start for your lawn. To put this into perspective: A tree’s roots are often considered to be twice the size of the canopy, meaning that the unseen root system that anchors the stump in place is likely massive. This massive system makes for a heavily anchored stump that would need numerous large pieces of equipment to dig a large, difficult to fill hole in your lawn and then hoist out the hundreds or thousands of pounds stump out of the ground. By grinding it in place, we disrupt far less of your lawn and turn the stump into easy-to-haul-away wood chips and chunks. Best of all, the work is done in a single, short session, giving you back your lawn quickly. Our tree service professionals will be in-and-out before you know it, taking all evidence of the former stump with them. It is possible to have that stump gone using our affordable and hassle-free Shelby Charter Township stump and tree removal service. Contact us today to learn more or schedule your stump removal!